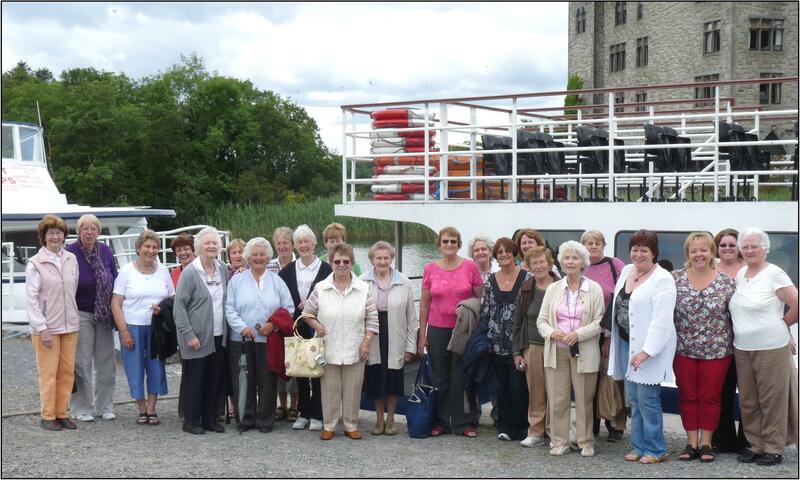 What a wonderful time was had by all on the annual boat trip on the Corrib this year, visiting Inchagoill Island and Cong, and highly organised under the leadership of Eileen Lydon and Mary Maguire and many more! This year’s trip was specially funded by Forum, Connemara and was a joint venture between the Seniors, Clann, Forum and the team of helpers from the Community Centre Anne Gibbons, Mary Waters and Anne Joyce. Approximately 40 people travelled on the Corrib Ferry; it was like being on a cruise – so relaxing and with a wealth of information, tradition and history being presented to all on board by David Luskin and his colleagues, what wonderful talent and expertise they have. The weather too was superb and on arriving in Cong the gourmet team took over. Rose Clancy, Maura Lydon and the helpers from the Community Centre served a most delicious lunch which was prepared by Breathnacht’s. Of course there were drinks too, and much chat! We were privileged to have Billy Hoye, accordionist, with us who kept the dancers on their toes and entertained us with his lovely music. It was a great day out and thanks to all who made the day so special. We’ve such a wonderful service right on our door step – well worth a trip, and thanks again to Corrib Ferries. Pictured: L to R: Bernie Neary, Anne O’Shaughnessy, Helen McQuinn, Ann Gibbons, Mary McGuire, Maura Lydon, Nuala Walsh, Una O’Halloran, Margaret Goggin, Maureen Conneelly, Vera Harnon, Mrs. Gibbons, May Joyce and sister, Ann Joyce, Mary Melia, Chris McDonnell, Eileen Lydon, Rose Walsh, Brid NicIomanire, Cathy Keane and Geraldine from Forum, Ann Walsh.